This event is planned from beginning to end with young families in mind! 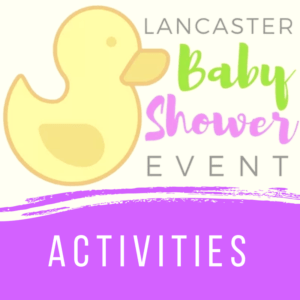 There will be hundreds of dollars worth of giveaways available at the Lancaster Baby Shower this year, and there will be fun activities & amenities available as well. If you have any questions or concerns, you can contact the event organizers here! Invite the grandparents, invite your friends, share on social media & help us spread the word. We look forward to seeing you at the Lancaster Baby Shower! The Lancaster Baby Shower is taking place on Saturday, April 7th, 2018 from 9am to 1pm at Spooky Nook Sports in Manheim, PA.
No tickets needed for this event! Admission is completely FREE! You can pre-register using this Google Form! It’s FREE and allows you to skip the lines at registration on April 7th. You can also register on your smartphone while you are waiting in line at the event if that is easier for you! Just look for the sign “pre-registered attendees” to receive your welcome information and raffle ticket.